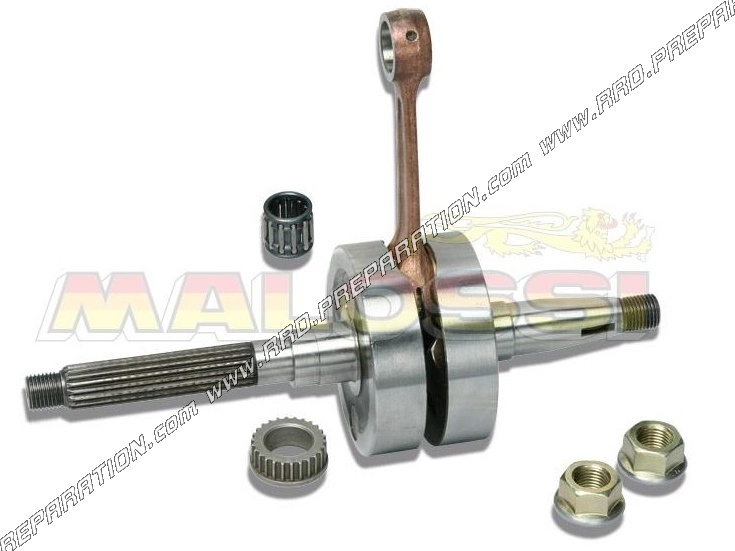 Special linkage rod 85mm, reinforced design upscale MALOSSI MHR RHQ! 255,36 € 255.36 tax incl. Here is the most high-end market in long-stroke crankshaft, used in competition on Piaggio scooter engine. This ultra vilo reinforced thanks to its high-end steel, its 85mm rod MALOSSI MHR forged 18 Ni Cr M05 mounted on precision roller bearings for high speed, plus crank, improved lubrication ... will make it a key element for those who wish to equip their machines rated parts. Equipped with solid masses that always bring you more pre compression therefore more performance! All components of this linkage have suffered minium 5 heat treatments, diets high does not make him afraid ... Indeed, its dynamic balancing amply bear the 16,000 rounds without difficulties to reach and mostly safe! Supplied with its cage needle has, obviously enhanced reviewed and corrected model. Machining and finishing at the height of hope, perfect! Clearly, a crankshaft designed to support both the couple as high revs larger kits, specially designed to accompany the high engine MALOSSI MHR TEAM Piaggio engine on aluminum. (reference MALOSSI 31 8881).